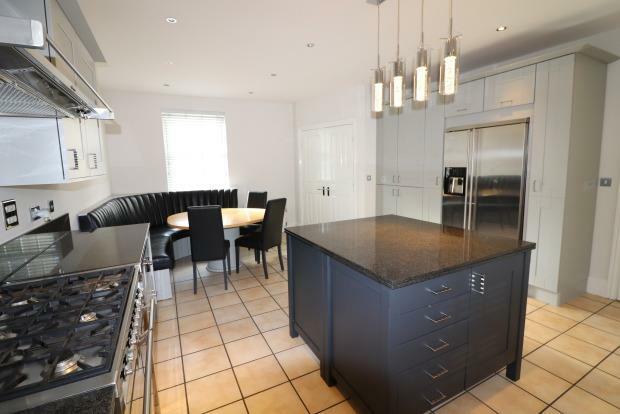 6 Bedroom Detached House To Rent in Chelmsford for £2,750 per Calendar Month. Located on one of the finest roads in Beaulieu Park within a short walk of New Hall School, with views towards open fields. Given the properties popular location, within catchment of many sought after schools, as well as its quality and size of accommodation we strongly recommend this family home must be viewed to avoid disappointment. The property has been re-decorated throughout & new Carpets have been laid. Solid oak flooring, wooden Shelving unit, Telephone socket, under stairs storage space, Recessed spotlights, Carpeted stairs to first floor landing, Double doors to Kitchen, Doors to Cloakroom, Sitting Room & Dining Room. Solid oak flooring, white push button WC, Basin, Recessed spotlights, Obscured window to Rear with Roman blind, Door to Entrance Hall. Tiled floor, TV, Satellite & Telephone Sockets, Granite & Solid Wood worktops, under-unit Lighting, 2 bowl Stainless Steel Sink, 'American style' Fridge/Freezer, integrated Microwave/Oven, integrated Dishwasher, freestanding 6-burner Range Cooker, free standing Island with Wine rack & Breakfast bar, Stainless Steel Extractor Hood, Window to front & side with white wooden Venetian Blinds, Recessed Spotlights, double doors to Entrance Hall, door to Utility Room. Tiled floor, Table & Seating for 9. Solid oak flooring, TV & Telephone sockets, Curtains to Windows either side of French Doors opening onto Rear Garden, Built-in Shelving & Cupboard space, Recessed Spotlights, double doors to Sitting Room, door to Entrance Hall. Solid oak flooring, TV, Satellite & Telephone Socket, Gas Fireplace, Wall Lights, Recessed Spotlights, Window to front with white wooden Venetian Blind & Curtains, double doors to Entrance Hall & Dining Room. Tiled floor, Washing Machine & Dryer, Utility Cupboard housing Fuse Board, Meters & Alarm System, Boiler, Extractor Fan, door to Hallway & into Rear Garden. Carpeted, 3 x Windows to front with Curtains, Carpeted Stairs rising to Second Floor, doors to Main Bedroom, WC & double doors to Lounge. Carpeted, TV, Satellite & Telephone Socket, Gas Fireplace, Wall Lights, Recessed Spotlights, French doors to Rear facing Juliet Balcony with Curtains, Windows to front & rear with Wooden venetian blinds and Roman Blinds, Double Doors to first floor Landing. Tiled flooring, white push button WC, Basin, Extractor Fan, Obscured window to Rear, Door to first floor Landing. Carpeted, TV, Satellite & Telephone Sockets, Window to front with white wood Venetian Blind & Curtains, open to Dressing Area, Door to first floor Landing. Carpeted, Built-in double Wardrobe, Window to rear with white wood Venetian Blind & Curtains, open plan to Main Bedroom & Door to En-suite. Tiled flooring, white suite comprising of push button WC, Basin on cupboard, Bath, separate Double Shower Cubicle with thermostatic mixer Shower, Mirrored Cabinet, Extractor Fan, Recess Spotlights, obscure Window to Rear, door to Dressing Area. Carpeted, Loft Access, Airing Cupboard, French doors to Front facing Balcony with Curtains, Doors to Bathroom & Bedrooms 2, 3, 4 & 5. Carpeted, TV & Telephone Socket, Window to rear with wooden Venetian Blind & Curtains, door En-suite & second floor Landing. Vinyl flooring, white suite comprising of push button WC, Basin, separate Double Shower Cubicle with thermostatic mixer Shower, Mirror, Glass Shelf, Shaver Socket, Extractor Fan, Recess Spotlights, obscured Window to rear with Roman Blind, door to Bedroom 2.